What The Cat in the Hat was to adults, the beloved Elephant & Piggie series, is to kids. After 25 books, author Mo Willems ended the line in 2016. To salute his efforts, last fall the New York Historical Society celebrated his career with a museum exhibition. Now, the New Victory Theater is celebrating the comedy duo with Elephant & Piggie's We Are In A Play!" -- based on six of Willems' books. And their young audiences could not be happier. Elephant Gerald (Evan Casey) and Piggie (Lauren Williams) click as "bestus" friends, who embark on a romp through parties, dances and a crack at trumpet playing on a day when anything is possible. Elephant wears a gray jacket, pants and glasses, while Piggie sports a pink dress and pigtails. Alongside the Squirrelles (Jamie Eacker, Jennie Lutz and Justine Moral), the two sing silly songs, enjoy a few wacky moments and otherwise revel in each other's company. Willems wrote the script and lyrics; Deborah Wicks La Puma composed the music. There are life lessons about friendship, caring and respect -- even stepping outside your comfort zone. Best of all, from the audience's point of view, they get a chance to join in the fun. 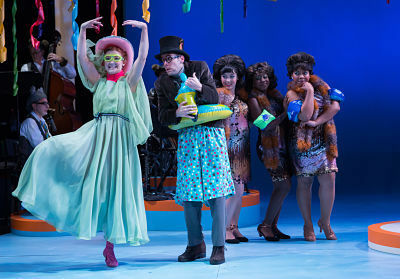 The show is unabashedly sweet and packs punch for its pint-sized theatergoers. For adults, there is Paramour at the Lyric Theater. 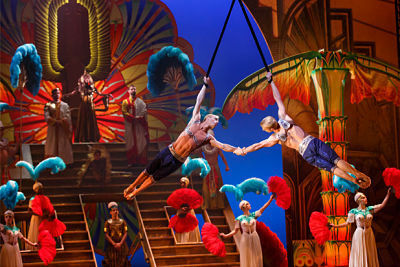 It is a departure for Cirque du Soleil: The acrobatic brilliance remains, but it's coupled with the Broadway musical genre, set in Hollywood's golden age. The story is a love triangle -- Hollywood director A.J. (Jeremy Kushnier) plucks Indigo (Ruby Lewis) from obscurity to turn her into a star. Her composer partner beau Joey (Ryan Vona), isn't amused. In between the predictable plot lines, the $25 million production offers inventive stage acts. At a speakeasy, waiters perform nifty turns. There's always some Cirque-style business mixed with various scenes, like the stunning high-wire act from the Atherton twins. Most of the visual elements, coupled with an ample use of video projects, are dazzling. Director-conceiver Philippe Decoufle keeps the action flowing, and every now and then, the stage performances and the romance connect. One of the best moments is the "Love Triangle," where a trio of dancers recreate the emotional tug-of-war in mid-air. There's even a comic-book-style finale chase scene that's terrific to watch -- and a bit reminiscent of Spider-Man: Turn Off The Dark, which also played the Lyric. The twist, and the downside, is the story itself, which is banal. That doesn't mean the show isn't entertaining -- or the leads don't deliver. Just that as Broadway musicals go, it's more Las Vegas than Great White Way.